Its getting warmer and the summer is upon us. Its a crucial time for any pet but especially for the French bulldog. The shorter breathing system of the French Bulldog is what puts them at such very strong risk for heat stroke. Shorter airway means less possibility of cooling the air which the dogs draws into its body. Dogs do not sweat. Their only means of reducing built-up body heat is by panting. The leading cause of heat exhaustion, and its advancing into heat stroke; is leaving a dog in a hot car. Even on a mild day (75-80 degrees F), the temperature inside a car can raise up to 130 degrees rather quickly. Leaving a window slightly open will not prevent heat build-up. Leaving a dog in a car on a warm day is a risk to the dog’s life. There are many variables in triggering a dog to experience heat exhaustion; the dog’s physical condition, its age, its coat length, its breed, and its acclimatization to heat. An older, couch-potato, “snuggle the air conditioner” dog will have less tolerance to the heat than a young, romp outside all day, adolescent. Both the very young and very old dogs are among the highest risk categories. 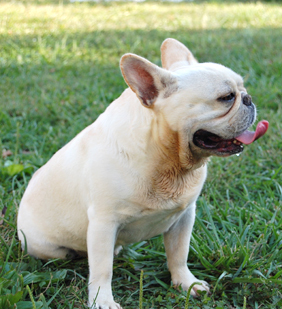 All Frenchies, no matter how well they breathe, or how active they are, are at risk from Heat Stroke. The skin on the inside of the ears becomes flushed and red. Heat stroke is an emergency situation. If your dog shows signs of heat stroke, you must cool him down as rapidly as possible. Don’t wait for veterinary treatment. Heat Stroke is an Emergency – Treat the dog NOW! DO NOT try to force your dog to drink. His swelling airways can cause any liquid he takes in to be regurgitated and possibly aspirated into his lungs. Hose the dog down with cool water – not cold. Apply an ice pack to the dog’s head, and soaked towels or any other form of fabric to their body. If at all possible, get him into a tub of cool water — again, cool – not cold! However, in an extreme emergency if cold is all there is, use it. If none of this is working, a cool water enema can help to cool the dog internally. Be careful not to induce to rapidly, or with water cooler than a few degrees below body temp, or you can put your dog into serious shock. As your dog is panting, his airways are swelling, causing him to pant harder yet again. You need to break this cycle. Children’s allergy treatment Benadryl can be administered by mouth from dropper. Consult your vet in advance, or by phone is necessary, for exact dosage. Better still is to obtain a supply of injectible Benadryl to keep on hand. If none of this is Do not stop treatment until your dog’s body temperature is approaching normal. As soon as the dog’s internal temperature has stabilized at a near normal level transport the dog to your vet. Heat stroke can leave permanent damage. Many dogs will play until they drop. You must supervise the games, and determine when it is time to stop. During hot weather limit your dog’s time outside. Be sure that there is a shaded area for your dog to rest in and that your dog has a constant supply of clean water. Never, EVER underestimate your dog’s susceptibility to heat stroke. 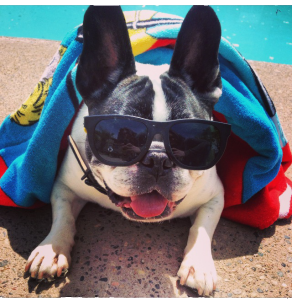 Limit their exposure to temperatures which you might personally find only mildly hot, be conscious of your dog’s proximity to hot pavement, NEVER leave your Frenchie in a locked car in even warm weather, and always allow them lots of access to fresh water, shade, and cool areas to escape from heat. Be alert, and be prepared with the things you need to save your dog’s life. Most of all, always make sure your dog has access to a cool shaded area, and NEVER leave them in the car, even in weather which is only fairly warm. Frenchies can over heat in an instant! Great rundown of relevant safety info that a LOT of people might not be aware of. Thanks for keeping the bulldogs safe. Can we go outside and pee on things already?